The delivery times provided by Colan Australia are estimates only. Colan Australia will not be held accountable for late deliveries or loss or damage relating to late deliveries. In the event that multiple items are ordered, part deliveries may be made where stock is not available. All reasonable attempts to notify you will be made using the details you provided. Please ensure you enter the correct delivery address. 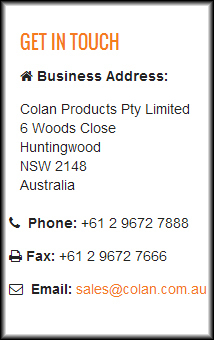 Colan Australia cannot be held responsible for incorrectly entered delivery addresses. Orders of $2500.00 or more Ex GST are FIS (Free in to Store) for Metro locations nationally. Orders less than $2500.00 Ex GST are charged according to size and weight and will be quoted at the time of purchase. Deliveries to non-metro areas are only charged the delivery fee from the closest metro area to the delivery address.